You say gelato, I say Ice Cream. A rose by any other name etc. What is Gelato? Gelato has a lower butterfat content, and slightly less sugar, than most American ice creams. American ice cream is typically made from heavy cream, while Italian gelato is based on milk with egg yolks added for richness and nonfat dry milk stirred in for body and texture. Gelato is also mixed differently. American ice cream might include up to 50% air. 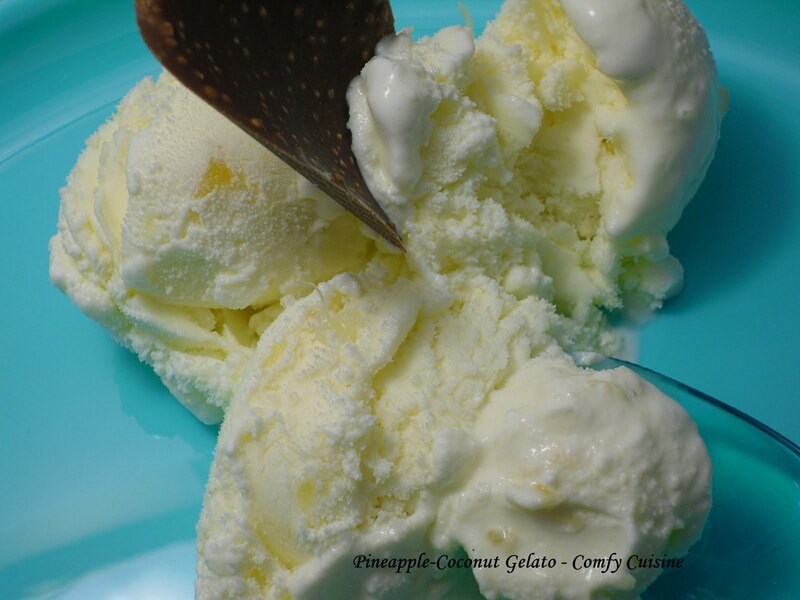 Gelato is frozen quickly in small batches; its denser, creamier and richer. Oh, and one more thing; do you need an ice cream maker to make ice cream? *1 Tbsp. rum adds delicious flavor; 2 Tbsps help keep the gelato soft and scoopable in the freezer. Add any more and you have a cocktail! For best flavor, pour the crushed pineapple with its juice into a saucepan and simmer for about 20 minutes, until most of the liquid has evaporated. You can skip this step and simply drain the pineapple, pressing to removed as much juice as possible. Refrigerate while you prepare the rest. In a saucepan, whisk together 1 cup of the coconut milk; the sugar, and the nonfat dry milk. Set the remaining coconut milk aside. Cook over medium heat, stirring frequently, until the mixture begins to simmer. Whisk to remove as many lumps as possible. While the milk/sugar mixture is heatingj, put the 2 egg yolks in a bowl and whisk to combine. Gradually pour about 1 cup of the hot mixture into the bowl with the egg yolks. Whisk to combine, then transfer the egg yolk mixture back to the saucepan. Stir the custard over medium-low heat for a few minutes, until it thickens a bit; it should be about as thick as heavy cream. Remove from heat and stir in the remaining 2/3 cup coconut milk. Add the vanilla or coconut flavor. Transfer the custard to a blender, add the pineapple and process until smooth as possible. Transfer to a covered container and refrigerate overnight. If you have an ice cream maker - Within about 4 hours of when you want to serve, add to your ice cream maker. Towards the end of the churning time, add the rum to combine. No ice cream maker - Pour the chilled custard into a bowl, place in the freezer uncovered, and stir every hour. After about 4 hours it will be soft-serve consistency. Add rum if using. Continue to stir and freeze until it's the way you like it. Vist Miz Helen's Country Cottage! Beautiful gelato display!I'm happy to learn that I can prepare this without an ice cream machine too! The tropical flavors are delightful. I am so going to try your recipe! All I want is a bowlful of your gelato. Thanks for linking this up to Sweets for a Saturday. Patti your creamy dreamy gelatin is featured today. On my Friday linkups.....thanx for sharing it and I hope u can stop by again! Your Pineapple Coconut Gelato is over the top! It looks really delicious. Thanks for sharing with Full Plate Thursday and come back soon!